On Sunday morning, August 13, 1961, the citizens of Berlin woke up to a remarkable event. While they were sleeping, East German soldiers had constructed a barbed wire fence around the entire city of West Berlin. Workers were already beginning to tear up the roads between the east and the west, and armed soldiers stood at various points along the fence, making sure no one got through unless authorized. Some people found themselves faced with a dilemma. If you were a West German, but lived in the east, you were given a choice: become a citizen of the GDR or get the hell out. For East Germans working in the west the choice was little more severe: stay, live, and work here. East Germans who, for whatever reason, found themselves in the western sector that night, the choice was the hardest of all. They could stay in West Berlin, but it would mean giving up everything they owned. In some cases, it meant leaving behind entire families. So how did this happen? Only a few months earlier, Walter Ulbricht had assured everyone that East Germany had no intention of building a wall (“Niemand hat die Absicht, eine Mauer zu errichten!”). Now, suddenly, here it was. Within a few weeks, the barbed wire barricade turned into a fence, and, eventually into the wall with its swath of raked earth, tank traps, nail beds, and 24-hour hyperlighting. Buildings along the border were torn down and East German border guards were given orders to shoot to kill anyone trying to cross the border illegally. The GDR always insisted that the wall was never meant to keep people in, but to stop the pernicious influences capitalism, and the intentionally disruptive tactics of the United States and West Germany, both of which were hell-bent on destroying the GDR (true enough). For them the wall was an anti-fascist protection barricade (Antifaschistischer Schutzwall). To explain and defend the building of the wall, the documentary film branch of DEFA made Look at This City! (Schaut auf Diese Stadt), a film exploring the forces at work against the GDR, and what led to the barrier’s eventual construction. And what a film it is! Director Karl Gass has created a lively piece of cinema that, whether you agree with any of it or not, will keep you entertained. The film gets off to a rip-roaring start with U.S. military troops marching in formation set to the sounds of The Coasters singing “Yakety-Yak.” This is followed by more scenes of U.S. military personnel overlaid with various American big band tunes. This isn’t a radio station from America, the narrator tells us, but one from West Berlin. The film follows this basic structure throughout, with the American forces shown to pop tunes and big band numbers, and the scenes of factories and people in East Germany shown to the strains of Beethoven and other German composers. It is hard to say if the filmmaker thought that the western music would appear coarse and vulgar to the German audiences. The narration seems to suggest that this was the intent, but it is this very juxtaposition between western pop culture and German classicism that makes this film so much fun to watch. In one scene, clueless American soldiers take snapshots in front of the Soviet War Memorial in Treptower Park. This is followed by scenes of WWII war footage showing the attacks on Berlin. The message of the film is stated at the beginning and at the end: the GDR wanted peaceful coexistence; it’s the west that provoked the building of the wall. There is also evidence that many of the decisions made by West Germany were intentionally designed to play hob with the East German economy. This was done largely at the behest of the United States, which had become rabidly anti-communist during the fifties. Nowadays, people point to Joseph McCarthy as some sort of anomaly, but, in truth, the prevailing sentiment in the U.S. was “better dead than red.” McCarthy was just the most visible proponent of this philosophy. The U.S.-sponsored radio station RIAS (Rundfunk im amerikanischen Sektor) was actively, even aggressively at times, using its broadcasts to spread dissent in the east. As the film points out, Stalin made overtures to help create a united Germany, free of both Soviet and American troops (this was also one of the tenets of the Potsdam Accord), but Adenauer dismissed the offer as a ploy. Public sentiment was in favor of Stalin’s proposal, but that counted for little. The Americans were still calling the shots and their anti-communist fervor made it impossible for Germany to reunite. 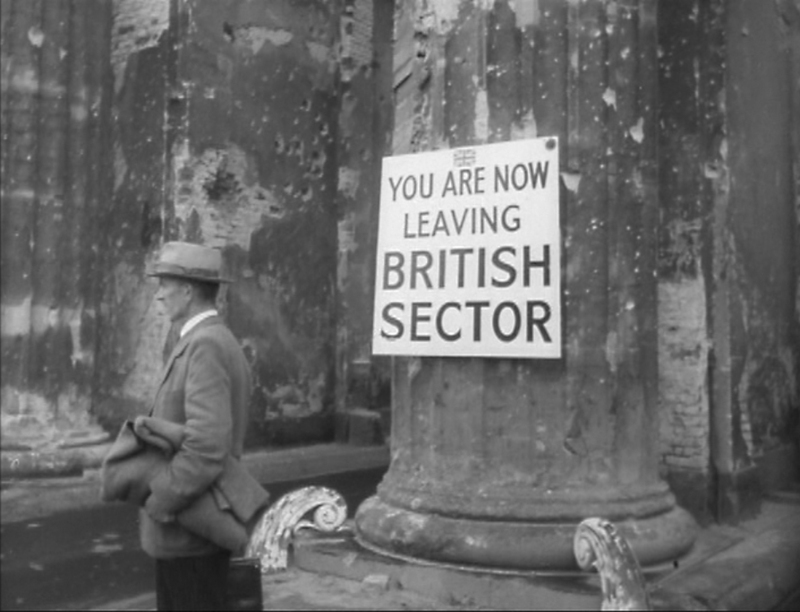 But the film also overstates its claims, blaming all of East Germany’s economic problems on the west. In truth, many of its problems came from Ulbricht’s refusal to adopt any meaningful reforms lest he cede one iota of his authority to others. In the previous post (Destinies of Women), I talked about the fact that, from 1946 until the early fifties, people were going to East Germany to find work because the Soviets were doing a much better job of getting German industries up and running again. Now the tables had turned. People started to leave East Germany in favor of opportunities in the west. The borders between the two countries were closed, but the agreement to keep Berlin open as a jointly controlled city made it the perfect place to cross over. The Republikflucht could have been stopped, but Walter Ulbricht wasn’t the man to do it. After the protests of June 17th, 1953, the Soviets agreed to help quell the protests providing that Ulbricht enact meaningful reforms. Ulbricht took the Soviet’s help, but instead of implementing changes, the GDR leader dug in his heels, pointing to the events in Poland and Hungary as justification for his position. As thing deteriorated further, Ulbricht asked the Soviets for more and more financial aid, but they had problems of their own dealing with the new U.S. president, John F. Kennedy, who, by Krushschev’s account was “not very clever,” citing the Bay of Pigs debacle as evidence of this. As with the United States, you were more likely to lose your job in West Germany during the fifties for being a member of the Communist Party than for being a former Nazi. No one knew this better than the film’s narrator, Karl-Eduard von Schnitzler, who lost his job at Nordwestdeutscher Rundfunk in Hamburg, for his leftist leanings. Mention von Schnitzler, even today, to anyone who grew up in East Germany, and you’ll get an immediate reaction; usually a look of disgust. Not even Stasi chief Erich Mielke or Honecker’s hated wife Margot prompt such strong reactions from people. In his song, “Ballade von den verdorbenen Männern” (“Ballad of Corrupt Men”), Wolf Biermann referred to him as “Sudelede,” a nickname that stuck. In her grim, but highly readable book, Stasiland, Anna Funder reports that he was also known as “von Schni–,” because that’s how long it took people to get up and change the channel when he appeared on TV. At first glance, von Schnitzler looks like an unlikely candidate for the communist cause. His father was a well-respected German diplomat and heir to a German banking dynasty. Karl-Eduard was cousin to Georg von Schnitzler, a member of the IG Farben board of directors and one of the people convicted of war crimes during the Nuremberg Trials (see Council of the Gods). He was also reportedly the illegitimate great-grandson to Frederick III, whose reign lasted a mere 99 days. After the Wende, von Schnitzler became the target of a great deal of public criticism He never wavered from his position that the Wall was a good thing and that the state had every right to shoot people trying to climb over it. His appearances on television talk shows were often rowdy affairs with people constantly interrupting him whenever he tried to defend his position. The new world order took its toll on von Schnitzler. It’s not easy being the most loathed person in your own country. Talk show appearances after the Wende show a man who continued to try and defend his position in the face of catcalls from the audience. He died of pneumonia September 20, 2001 in Zeuthen, a small municipality south of Berlin. Look at This City! was directed by Karl Gass. A West German by birth, Gass was working in radio in Cologne after the war when—like von Schnitzler—he came under fire for his defense of the German Communist Party (KPD). In 1948, he moved to East Germany, where he continued writing radio scripts and began studying film production. During the fifties, he started making Der Augenzeuge (Eyewitness) newsreels, which were screened before the main features in East German cinemas. Look at This City! was his first attempt at a feature film, and it is apparent that the years for study paid off. The film, with its combination of new and old footage with new and old music, still stands as a classic example of documentary filmmaking. Gass’s biggest success as a director came in 1985 with Das Jahr 1945 (The Year 1945), a look at the last 128 days of the Third Reich. Gass continued making documentaries right up until the Wende. His last film, Nationalität: Deutsch (Nationality: German) is a look at the life of a small-town teacher from the Weimar Republic, through the Third Reich, to the GDR. With the fall of the wall, no one so closely associated with the socialist aspects of East Germany really stood a chance of getting films made in unified Germany. He spent his final years writing non-fiction, primarily on the history of Prussia. He died in 2009. Predictably, reactions to the film divided along political lines, with critics in the west calling it propaganda and critics in the east defending its message. Reviewers both east and west acknowledged that it was a well-made film. 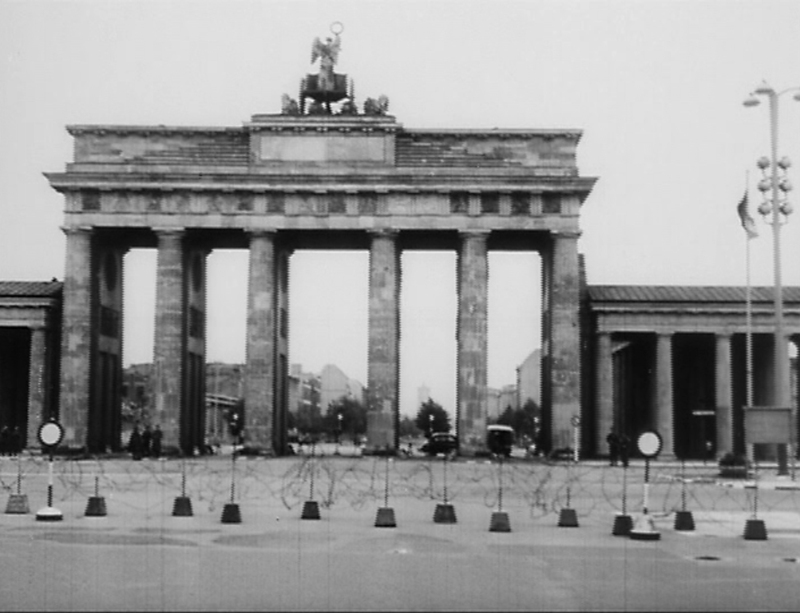 The film drew large audiences, especially in Berlin, where people were still trying to wrap their minds around this new border that divided their city. Today, the film is recognized as both a classic documentary and a unique chronicle of the events that led to the Berlin Wall. The last episode of Der Schwarze Kanal. * Much has been made of JFK’s infamous “Ich bin ein Berliner,” statement. The correct wording would have been, “Ich bin Berliner.” By adding the definite article ein, as many have pointed out, he was using the correct form to say that he was a “Berliner,” which is a kind of filled donut popular in Germany. Others have defended him, saying that the definite article could also be used to stress that he was with the people of Berlin (although, I think that untranslatable little bit of German grammar, doch would have been the logical choice for that). The statement has been used, from time to time as a running joke in German movies, and was even used as the name of a film about a con man who claimed to be the illegitimate son of JFK. Nonetheless, I think everyone listening to his speech that day understood what he was trying to say.